We're a different kind of life insurance company: we're not for profit. We give back revenues to our members, not investors, in the form of refunds and benefits. Founded in 1890, WoodmenLife also gives back on a local level through chapters that help us lead community service projects you care about. We show our caring in many ways, including presenting American flags to civic and community organizations, and by providing assistance to senior citizens, the physically impaired and orphans through our local chapter system. Capital Health Plan is a nationally recognized comprehensive medical plan known as an HMO or Health Maintenance Organization. We proudly serve Calhoun, Franklin, Gadsden, Jefferson, Leon, Liberty, and Wakulla counties in Florida. Marks Insurance Agency offers a full line of residential, auto, commercial and life/health insurance. We have been an independent agency serving the coast with all of its insurance needs since 1930. We are located in Apalachicola, Florida with a branch office in Tallahassee. Marks Insurance Agency strives to provide the best insurance products and knowledge to our customers. I am Teresa Howard your local representative for WoodmenLife Insurance, I am a lifelong resident of Franklin county and a former local educator. My husband Chris and I have 3 children. I am licensed in Florida & Georgia. Contact me today to see how I can help you with meeting your insurance goals. WoodmenLife was founded in 1890 as a not for profit. The organization gives back to its nearly 700,000 members, who join together in a shared commitment to family, community and country. With a legacy of financial stability, WoodmenLife offers quality life insurance and retirement products. To learn more about the organization, visit WoodmenLife.org . If you own a residential home, vehicle, or commercial property in Florida, insurance protection is key to safeguarding your investment. Seascape Insurance Group Inc. in Apalachicola, FL can provide you with customized coverage on the insurance policies you need. Understanding your insurance options will enable you to benefit from all that insurance protection has to offer. We invite you to visit our office, to talk with an experienced agent, and explore our comprehensive policies. As you become acquainted with the different types of insurance at your disposal, you can make wise decisions in protecting your home, business, and auto. Butler Agency LLC is an independent agency with markets for homes, rental property, wind, flood (including CBRA and private flood), businesses, artisan contractors, builders' risk, Workers comp and Group Health Insurance. The Butler Agency was recognized in 2012 and nominated for NFIP Agency of the Year for notable flood risk awareness efforts. 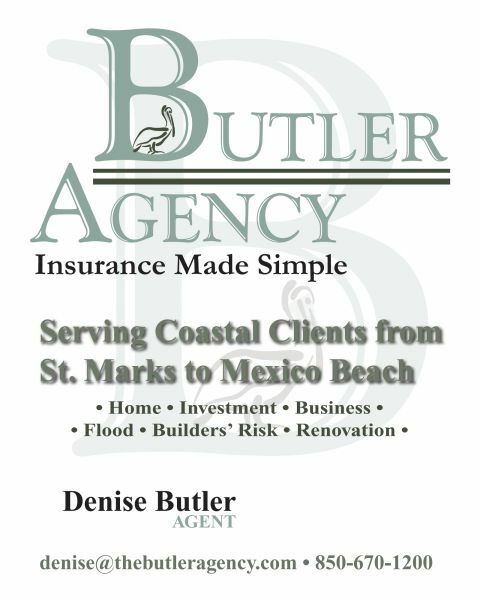 Agent Denise Butler frequently holds workshops on the ever-changing insurance market for coastal Florida. They are located at 135 US Hwy 98 in Eastpoint. Hannon Insurance Agency was established in 1942 to service the needs of the residents of Port St. Joe and surrounding areas including Cape San Blas, Apalachicola, Mexico Beach and St. George Island. Although the Insurance industry has changed since 1942, the goals of our agency remained unchanged - To provide quality insurance products at an affordable price while offering service that is second to none. We pride ourselves on the character and quality of our team with experienced insurance professionals ready to serve your homeowner, auto, flood, boat renters and life insurance needs. Our team has also been voted the best of the Forgotten Coast ( Insurance Agency) for 2013, 2014 , 2015 and 2016.